The Moomins There are 38 products. Moomin House edible high quality cake topper with sharp picture and bright colors. Possible to add custome text. Sizes from A6 to A3 custom shapes. Moomin Grandma edible high quality cake topper with sharp picture and bright colors. Possible to add custome text. Sizes from A6 to A3 custom shapes. Moomin Grandpa edible high quality cake topper with sharp picture and bright colors. Possible to add custome text. Sizes from A6 to A3 custom shapes. 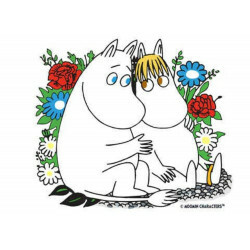 Moomin and Snork Maiden edible high quality cake topper with sharp picture and bright colors. Possible to add custome text. Sizes from A6 to A3 custom shapes. Moomin and Snufkin edible high quality cake topper with sharp picture and bright colors. Possible to add custome text. Sizes from A6 to A3 custom shapes. Moomins walking edible high quality cake topper with sharp picture and bright colors. Possible to add custome text. Sizes from A6 to A3 custom shapes. Moomins are resting edible high quality cake topper with sharp picture and bright colors. Possible to add custome text. Sizes from A6 to A3 custom shapes.